The official Fifty Shades neck tie features luxurious silver and grey quilting which can be worn or used as a soft and versatile sexual accessory and enjoyed both in and out of the bedroom. Experience tie-and-tease just like Ana and Christian by wrapping the tie's long, silky length around your lover's wrists, binding them together to enhance their sensory pleasure. If you choose to play this way, remember to agree on a safe word before you start. Your safe word can be anything, but you should both know it means 'Stop! 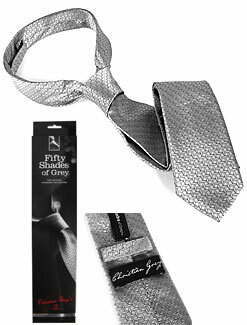 Part of the Fifty Shades of Grey Official Pleasure Collection approved by author E. L. James. I always loved the look of the tie on the book cover and wanted to get it for my husband to wear so I was so happy when I saw it was really available. The fabric feels amazing and the quality is just like those that you find in a nice department store I love how it has silver it it so it gives it a modern edge. Very handsome when he wore it out to dinner and even better when we used it to tie one another up later that night!